These exercises for shoulder pain relief should be done first thing in the morning to provide shoulder pain relief throughout the entire day. They can also be done in the evening to relax your shoulder muscles from a stressful day. Never go beyond your limit. Always do the exercises gently and without effort. Never strain or tense. These exercises are meant to be done in a loose and relaxed manner. All of these exercises should be done with the feet shoulder width apart. Inhale as you bring the backs of your hands towards your ears, fingers pointing to the sky and palms facing to the side. Hold your breath and this arm position for 5 to 7 seconds. You should feel a stretch in the anterior or front part of your deltoid muscle of your shoulder. 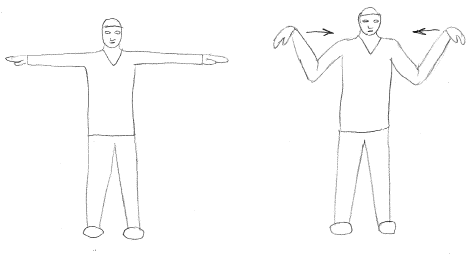 Exhale as you release your hand back to the sides. Keep your arms perfectly still so that just your wrists rotate,stretching and loosening all of the extensors and flexors in your forearm. Inhale as you squeeze your shoulder blades together. 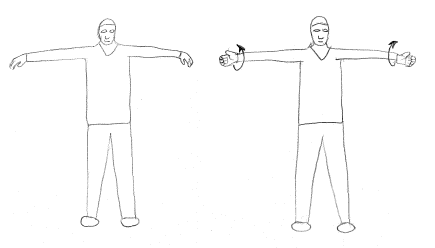 At the same time your palms fold downward and the backs of your hands are brought towards the side of your shoulders. Bring your knees together at the same time. This is to stabilize your lower back, isolating the upper back and shoulder muscles. 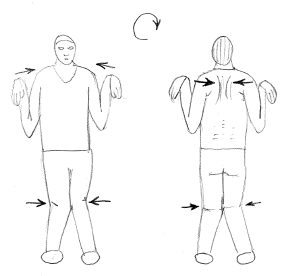 Hold your inhale and this body position (also known as "The Penguin") for 3 to 5 seconds. Exhale as you release your arms to the side and your knees relax back to a straight position. Repeat 5 or 7 times. Stretch your fingers to the side, lengthening your arms and loosening the shoulder socket where the humerus meets the scapula and clavicle. 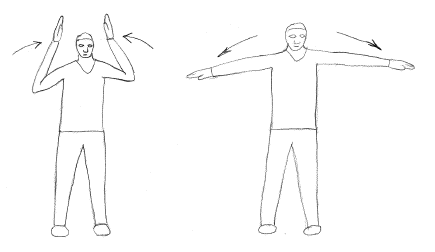 Inhale as you bend your wrist down so that your fingers point straight down towards the ground. Touch the tips of your thumbs and pinky fingers together. Exhale as you fold your fingers into a hollow fist, so that your thumbs are now on the outside of your Ring fingers. Your wrists are still bending down as much as you can, stretching the Extensors of top side of your forearms. Inhale as you bend your wrist upwards, bringing the knuckles of your hollow fists towards the sky. This strengthens the extensor muscles and ligaments in the forearms. Keep Inhaling as you tense your fingers into an "Iron Claw" as you straighten your fingers up towards the sky, keeping your arms straight out to the sides. Exhale as you push your palms apart to the sides. At the same time, stretch your fingers up towards the sky as far as they can go. This strengthens the extensors and stretches the Sinews and Flexors of the underside of your forearms. This stretch also opens the Carpal Tunnel section of the wrist and regulates the Median Nerve that runs down the center of the palm side of your forearms. 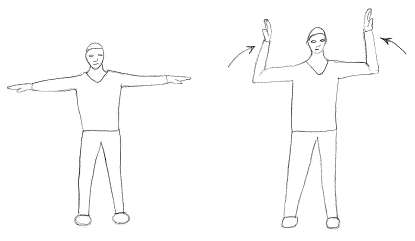 Repeat this entire sequence 3 or 5 times, starting with pointing the fingers down towards the ground, touching the thumbs and pinky fingers, and ending with the last stretch, pushing the palms away from each other.